High-gloss black lacquer frame with Masonite backing, scratch-resistant styrene face. Includes the saying, “It's not so much where we stand, but the direction we are moving.”. 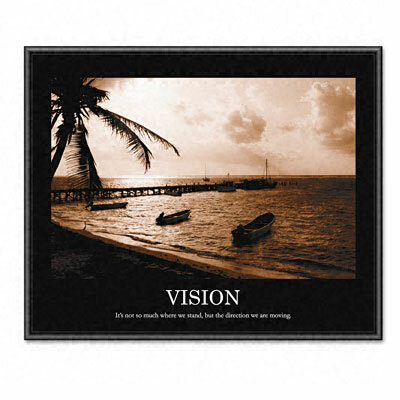 Motivate employees and co-workers by decorating the office with this beautiful print featuring an illustrated inspirational message. The new Sepia-Tone prints add a fine art quality to the office. The print is housed in a beautiful high-gloss, black lacquer frame with a Masonite backing and scratch-resistant, styrene face. Printed with the message: “It's not so much where we stand, but the direction we are moving.” Backed by a 90-day warranty.